The learning curve when starting online business is steep. There’s a ton to figure out, and it can feel like you have to know all the things and do all the things, right now!! When I got started, I struggled with figuring out what to concentrate on, and what could wait till later. And looking back, there’s a few things I wish I knew. 1. “If you build it, they will come” does NOT apply to your business. When you don’t know anything at all about working online, it can feel like all you have to do is slap up a website, write content, and the world will come clamouring to read it and throw money at you. The Field of Dreams advice doesn’t apply to your business, online or not. We all know that if you start a brick and mortar store, you have to advertise to get customers. But for some reason, I forgot that when I started online. People aren’t just going to find your site. They have to be directed to it. They have to come across your links somewhere — either on social media, on Pinterest or on Google. And they aren’t going to come back, no matter how good your content is, unless it’s entertaining and readable. That means you need to format blog posts to be attractive and easy to read. It means your website needs to load fast and be appealing and easy to navigate. If you don’t have those basics down, you aren’t going to go anywhere fast. But the real problem is that unless you actively share your stuff, you’re going to be the best kept secret around. And that means no traffic, no audience and no money. If you want to make money online, you need to tell people you exist and that you have something for sale. And you need to do it often. Regularly. Frequently. It can feel icky. It can feel like you’re bothering people. I was afraid of looking like I was begging for money. I was terrified of being branded a spammer. But promotion is the only way anyone will find out about you and what you have to offer. I’m learning that now, but I regret hugely all the time I wasted. Here’s the thing about social media: not everyone sees your posts every time you make an offer. In fact, few people do. So while it can seem like you’re over-promoting and that’s all you’re talking about, the truth is, not many are seeing your offers. Even if you’re emailing your offers, not all your list is seeing them. Sometimes, your emails get filtered. Sometimes they just don’t get opened right away. or even at all. And sometimes they get buried under all the other emails your reader has gotten. Only about a third of your list will open and read your emails at any given time, on average. Of those people who do see your offers, how many are in the market for those offers? How many have the time, space and budget for that offer? How many are ready to click buy? Not that many. It’s all about the numbers, really. If you want to make money online, you have to get your offer out there, to be seen by as many people as possible, as often as possible, so that you can catch the few who are looking, have the budget and are ready to buy. The rest are just going to ignore it. But they might remember you, if they see your offer often enough, for when they are in the market. But you don’t have to worry about coming across too strong. Those that are bothered by all your offers will unsubscribe, unfollow and make their way out of your path. And that just leaves room for the right people. Starting a business is hard. Doing it by yourself is harder. There’s no need to make it harder than it has to be! Especially when there are groups and mentors out there who are more than willing to help out a newbie. You may not be able to afford help right away, but there are tons of Facebook groups that are filled with people willing to answer questions. And that’s free. And when you can invest a little bit into help for yourself or your business, there are tons of options there too. From getting a virtual assistant to help out with social media promotion, or purchasing a coaching program to keep you on track, or buying an e-course to teach you a new skill for your business, there’s something for everyone, at every price point. Getting help is all well and good, but sometimes we get distracted in the guise of getting help. This is the “Oooh shiny” syndrome. You get that awesome sounding offer in your email inbox, or see this amazingly named product in a Facebook group, and you think, “Ooh… that could help me with my business!”. So you push buy, or subscribe, and you get it, you look over it, and then.. you forget about it. Or you do it partway and then get distracted by the next cool thing. The reason we do this is because we aren’t clear about where we are in our business or what we are doing. We don’t have a plan. And part of that is because we don’t know what we don’t know. This is a hard one to avoid. You hear bits and pieces about what you “should” be doing in your business. For example, if you’ve started a blog, you know you need a brand, and you need to be on Pinterest, and you need to have an email list, and there’s the tech piece of making it all work, and.. well there’s a lot. There’s numbers to track, and SEO, and creating an e-store, or a resource library, and a media kit and, and, and… It’s easy to get distracted, trying to do all the things! I wish I had learned to focus, and stay patient. I should have mastered one practice before moving on to the next skill, because now I’ve got all these courses, ebooks, and worksheets sitting in my Dropbox, and I’m not even sure what all I’ve got. It’s just wasted money and wasted space. It’s brain space too, not just file space. What have you learned about starting a business? 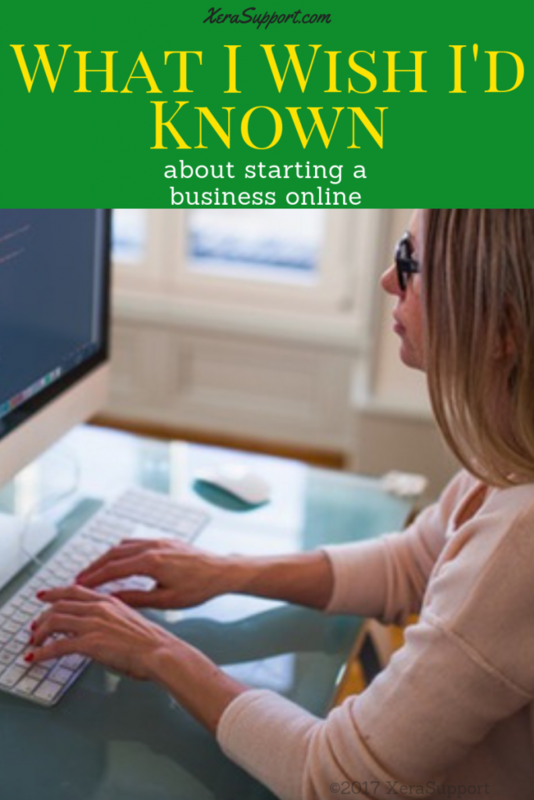 I asked some other successful entrepreneurs about what they wished they had known about starting a business online. Check out some of their great advice! “Don’t sell yourself short. Mark your prices where they deserve to be (not too low). Overwhelmed yet? Starting a business has a lot of moving pieces. And a lot of them aren’t obvious right away. Starting a business isn’t always easy. But it is so worth it. Just start with the basics, and take it one step at a time. And start with a plan! What is the biggest thing you’ve learned about starting a business? Do you have a plan? Start your business right. Use this handy little checklist to write out your business plan. It's easier than you think! Success! Now check your email for your business plan checklist! Copyright © 2019 XeraSupport. Powered by WordPress. Theme: Spacious by ThemeGrill.